The word Protogenoi can be translated as "first born", and in Greek mythology this was exactly what the first deities were. Hesiod in the Theogony would name 11 Protogenoi, with the first four seemingly born at the very start of time. The first of the Greek deities to come into existence was Chaos a goddess who would come to represent the air of the earth; differing therefore from the air of the heavens or the underworld. 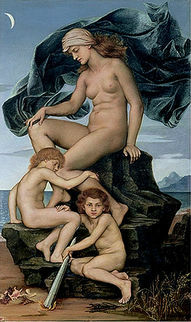 Shortly afterwards three other Greek gods and goddesses were formed. Gaia, a female deity, who, as well as being the personification of the earth, would also become regarded as the mother of almost all other deities of the Greek pantheon. Two male deities were also classed in the first wave of Protogenoi; Eros, the Greek god of procreation, who enabled the continuation of life; and Tartarus, a god who would exist beneath the earth, and would become the prison of the underworld. Hesiod would go on to name seven further Protogenoi, although in reality they were not "first borns", but rather the children and grandchildren of either Chaos or Gaia. Chaos would bring forth a daughter and a son. The daughter was Nyx, the Greek goddess of the night, who each day would leave her cave to bring night to the world. Nyx would work hand in hand with her husband-brother, Erebus, the Greek god of darkness. Nyx and Erebus would become parents to a third generation of Protogenoi, when Aether, the god of day, and Hemera, goddess of light were born. Aether and Hemera would of course work hand in hand just like their parents, and were responsible for banishing night and bringing forth the day each morning. Gaia would also bring forth other Protogenoi, with Ouranus, the god of the sky, and Pontus, the god of the sea, being earth's sons. Pontus, as representative of the sea, was important in Ancient Greece, but it was Ouranus who became the prominent god, being the first supreme ruler of the Greek pantheon. Gaia would also give rise to the only group regarded as Protogenoi, the Ourea, ten bearded gods that represent the mountains, mountains that included Mount Olympus. Whilst today, Hesiod is generally used as the primary reference for Greek gods, but other writers in antiquity would name other Greek gods and goddesses who were referred to as Protogenoi. The most famous of these additional Protogenoi are probably Chronos and Ananke. The two Greek deities are feature in Orphic tradition, with Chronos being the god of time, and Ananke, the goddess of compulsion. These two gods were said to be intertwined with everything that came afterwards. Other Protogenoi would also include Hydros, the god of water; Phanes, the god of appearance; Thalassa, the goddess of the sea's surface; Physis, goddess of nature; Thesis, goddess of creation; and the Nesoi, the islands.